Swirled with jam, this raspberry cheesecake is as pretty to look at as it is delicious. Before getting started, it may be helpful to review cheesecake baking tips to ensure a beautifully finished dessert. Preheat oven to 350 F. Grease a 9-inch springform pan and line the bottom with waxed paper. 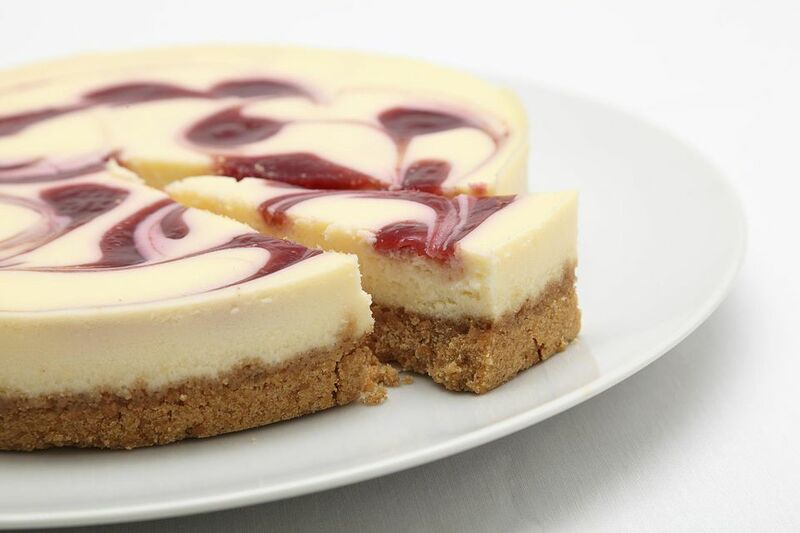 The raspberry swirl cheesecake can be wrapped well and refrigerated up to 3 days, or frozen up to 3 months. If your cheesecake always cracks, try this: Before heating the oven, place a baking pan half filled with hot tap water on the bottom rack. Bake the cake on the middle rack above the pan and don't peek. A cheesecake is done when the edges are slightly puffed and an area the size of a silver dollar in the center is moist and soft. It will firm as the cake cools. If you have trouble cutting this raspberry cheesecake, try it with dental floss or fishing line. Simply stretch a length across the top of the cake and, holding it taut, bring it down to the bottom of the cake. Let go of one end and pull the floss out with the other. You may want to do so before guests arrive.